Turn on the charm wearing this colorful and cute My Little Pony lanyard! 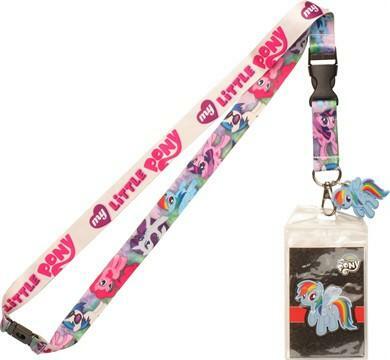 The My Little Pony Friendship is Magic Charm Lanyard is white and 21 inches long, with a charm and a clear plastic badge holder. The charm is shaped like Rainbow Dash, the female Pegasus pony from the My Little Pony Friendship is Magic animated TV series. One side of the charm features the My Little Pony logo and the other side has images of Rainbow Dash, Twilight Sparkle, DJ Pon-3, Pinkie Pie and Rarity!